For some reason, Psalm 104 (105, "Give thanks to the Lord") was selected to place a picture of a man writing at a desk as the dove of the Holy Spirit speaks into his ear. 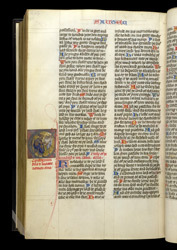 This psalm was hardly ever given a historiated initial in Latin psalters because it was not at the beginning of any of the book's traditional divisions, most of which facilitated the daily recitation of psalms in monasteries. It has been suggested that this initial 'C' was taken from one of the biblical canticles. Possibly it was placed with Psalm 104 because of the translation, "Knowledge ye to the Lord and inwardly declare his name", which could be seen to correspond to the inward inspiration of the Holy Spirit.